When it comes to hobbies, I am fickle to say the least. I change hobbies like most people change spouses, every two years after an initial investment of roughly half my income. That being said, my latest passion is kickboxing/MMA fighting. Why you ask? Because I am 35 years old, working through my 2nd pre-midlife crisis and there is a terrific amount of satisfaction that can be gained by punching people in the face. It is also a great workout. I have been doing this for a little over a year (so it is almost time to switch to hockey) and it has been a rocky year at that. I have had my nose shattered twice, both requiring surgery, and have been casted with a broken foot. That was all in the same 3 month period. Now I am recovered and back to bangin’ but am taking way more precautions than before. First, I only fight people I know and trust won’t go crazy and try to kill me. Second, I gear up every time. That means I wrap my wrists, wear a cup, and got myself some decent headgear and wear it every time I spar. So the headgear is what I would like to address here. I was at the point where I didn’t want my nose touched, at all, so I looked for the best possible protection I could find and ended up with what is basically a full on Hockey mask. New hockey, not Jason Vorhees hockey. It has a metal grill that completely covers your face and the construction is very heavy duty. This thing is going to last. When I put this on the first time, I was also delighted that I still had pretty good visibility, although it came down a little too far in front making looking up at taller targets difficult. Visibility in all other directions was as clear as a bell. It also absolutely protects the face, nobody is getting through that metal barrier, so I thought I was set. Now comes the issue, I used this to fight several people and here is what I found. When you put on a full metal facemask in a kickboxing gym, you become the perceived invincible man. What I mean is, everyone thinks you are so protected that they can simply T-off on you every time you spar. I had more brutal head kicks with that gear on than ever before because nobody pulls their punches or kicks. They think you won’t feel a thing because you are all caged up. My face was protected, sure, but my brain was still sloshing around in my melon and my neck was getting worse whiplash than a driving instructor teaching a blond to drive stick. I think we have established that I am not skilled enough to either keep my guard up or dodge anything, (Hence the previous injuries) and this fact was greatly exacerbated by this headgear. That is, it is virtually impossible to slip a punch with this thing on your head. You basically have this huge bobble-head target that takes a full impact no matter how much you move or how little their glove connects, because it isn’t slippery..nothing slips. That cage grabs their fists like Velcro and transfers the whole impact to your brain. 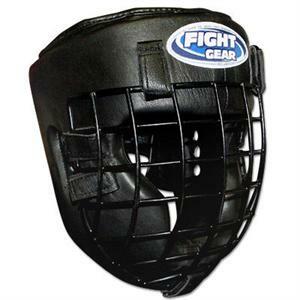 After getting knocked around a lot, I shifted to a smaller leather headgear that has cheek protectors that extend pretty well on both sides of my nose. It still leaves the nose exposed to shots, but takes the brunt of the blast and is really the best a guy could hope for. I am also now able to slip and move as my new headgear is more a part of me rather than a cartoonish helmet. The jokes about how to get to the ice rink have also subsided since the change. I think this cage would be great for people sparing with weapons, and as for straight face protection for say… stealing golf balls from a driving range during business hours, there really isn’t anything better. It’s great, as long as you don’t use it for kickboxing or MMA or combat sport where mobility, balance, and agility are important. It looked like a great idea, just didn’t pan out for what I needed.